Like driving, you don't want to be thinking about the mechanics of writing when writing. You can't drive safely this way and you can't write efficiently this way either. 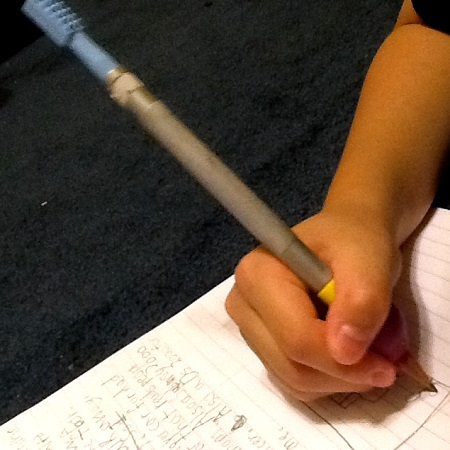 For many kids, writing is a terrifying and dreadful act. As a writer that makes me sad especially if it is happening with my own children. Thank you to Little Red Writing and ARK Therapeutics for making this special Young Writer's Giveaway Package. AGES: hmmm... with professional guidance or supervision, I would guess 3/4+ for the pencil kit? 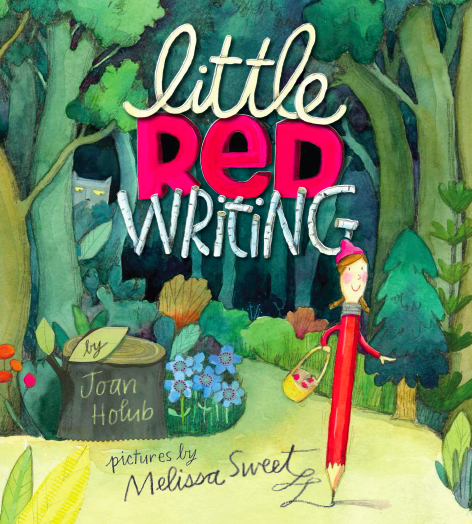 GIVEAWAY PACKAGE: One Lucky Winner Will Receive a Tran-Quill Pencil Kit AND a copy of Little Red Writing, a new book about writing written by Joan Holub illustrated by the great Melissa Sweet! COUPON CODE until 9/16/13: Check out my separate post on my picks and my code. One of the most enjoyable parts of this job is that I have the privilege of trying out new gadgets that help kids in school. We certainly have our share of academic struggles and so I was excited to try a pencil that had been on my mind for quite some time. It is basically just a pencil but the cool part is that it vibrates. Yes, vibrates and that really is the cool part. I think it is a little funny how this pencil is called "Tran-Quill" because if anything, I think it is a waker-upper but do we need that when we are writing? Kids are already so distracted these days- don't we need just more calm and focus here? To answer that, I'll paint a picture for you. You may have seen this in your own home. Susan said that if you are worried that your child may not like it, try them with an electric toothbrush. If holding it is not a problem for them than that is a good sign that your child will be okay with the vibration. Your child is ready to go, pencils, erasers, notebook, textbook, lighting, steady chair... they are all in place and he starts to work. The next thing you know, you are saying, "Eyes on paper!" or "Focus!" We were having one of those mornings one day and so I decided that this could be a good time to try out the Tran-Quill Pencil. I put a chewy top on it as well in case he wanted to chew. 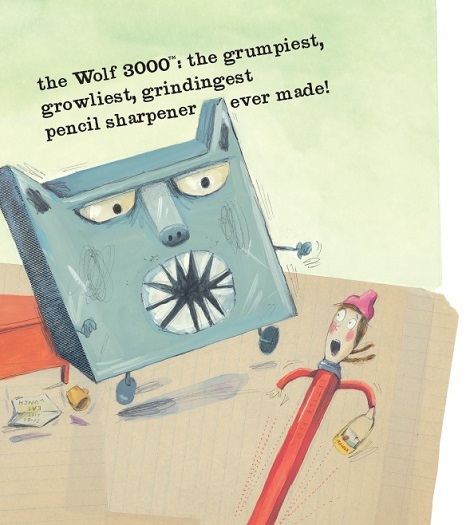 The vibrating pencil was turned on with just a twist of a chewy tip that looks like a long eraser and DING- it was as if I had turned on a switch in my son. (And I had been looking for this switch for quite some time!) Seriously, it's like he woke up and just starting plowing into his work. Five minutes before this photo, he was drifting off into space. He loves that dog ear topper he is nibbling on. And yes, I am campaigning ARK to make something older-kid friendly, dare I say "cool-looking." "Yes, vibration can do that," said Susan Roberts who I think is crazy smart. Her explanation was simple. "Basically the more you stimulate the brain the more learning there is." "Vibration does a lot of things," said Susan. "It provides a lot of resistance on some level. You have to hold the pen a little bit tighter so you're getting more sensory feedback." According to Susan, writing is a rote memory task and so we have to know all our letters to write. We can't think about how to write as we write just like you can't drive if you are thinking about how to push the brakes and when to step on the accelerator. Susan calls this "motor memory." Does this look simple to you? Not to me. Think about an electric toothbrush. Isn't that way klunkier? 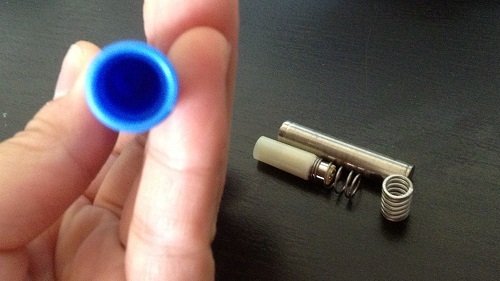 If you are making a purchase, I recommend you get the extra battery pack and/or spare parts kit. 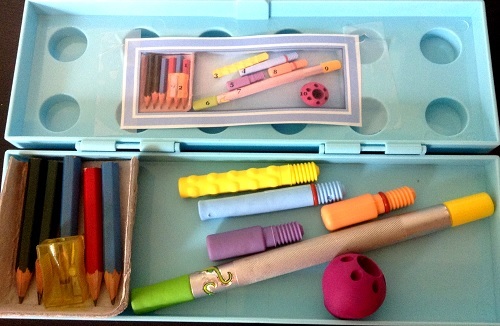 If you already own the Z-Vibe then you can buy the pencil attachments for less. With the vibration of the Tran-Quill Pencil, you will stimulate more nerve endings and that helps to create more motor memory. Isn't that just brilliant? To me, that says that whenever you use the pencil to practice writing, you'll just end up learning and memorizing those letters faster. Until writing becomes part of rote memory, keeping the child engaged during this time of practice can be difficult. "We want to keep the engagement long enough until motor memory goes in." I want him to use this all the time but I must put these stickers on the case so that it will come home. Also, he is less apt to lose this case because it is L-E-G-O. Numbering them will help keep "attendance" when arriving and leaving school. I also used the cardboard from my Time Timer Watch to keep the pencil tips separate. My kid puts everything in his mouth except most vegetables. Susan said because that the vibration of the Z-Vibe which makes up the core component of the Tran-Quill pencil engages more muscle fibers. "And the more muscle fibers then again the better you can construct that neuronal pathway to make automatic writing." "There are 25 tiny muscles that start and end in the hand and the vibration strengthens those muscles," she said. "It makes you more aware of those muscles and therefore allows you to use them more efficiently." Here some items that you don't get in the set. 3 and 4 are extra large bite and chew tips, 5 and 8 are smelly chew tips (Not too overpowering) 10 is the butter grip. More messages to ensure a safe return home. You can leave it in school but I like them to come home to encourage more responsibility. Gosh, if this special pencil does work that well then maybe they should be using it everytime they write! I asked Susan about that I couldn't believe what I heard. 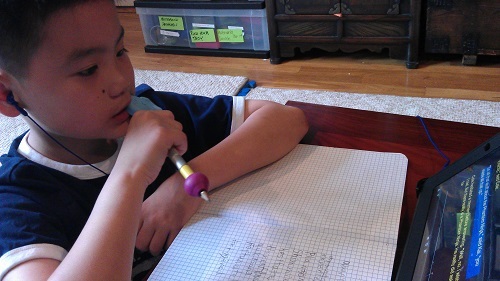 "I would encourage the parents to buy a Z-Vibe (Tran-Quill Pencil) and use it all the time." According to Susan, kids should not be writing for more than 20 minutes though so please keep that in mind. Additionally, Susan doesn't think that a child could overuse this pencil. "At some point the child is just going to say I don't need this anymore." I love the Tran-Quill Pencil so much. I love what I have seen it do. I definitely want my child to use it all the time and we have started sending it to school everyday. 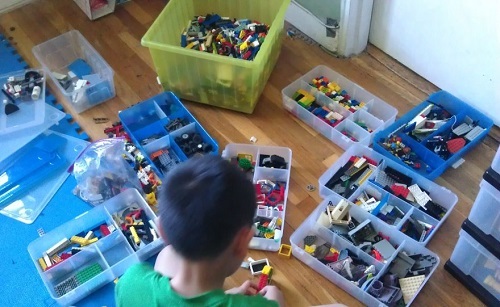 But if my kid ever tells me that he doesn't need it anymore, that is when I will be the most grateful for it because it will mean that this very important mission will finally be accomplished. It's going to happen. I just know it! One day Debra Lowsky, a speech therapist was fiddling around with a speech therapy tool that she had made on her own to use with her patients. Her husband, a mechanical engineer said, "What's that?" After Debra explained what she was trying to do, John decide to make something like that for his wife but better. Over the years, they have been creating a wide range of products that help people with tasks that so many of us take for granted, namely eating, speaking, writing,.. hey, those are pretty huge things. I can't thank these two people enough! Please use my link to check out their store! You just might find the thing that you always needed but never knew existed. They have it in plastic too. It's lighter and they come in different colors. It's also less expensive! And now try out to win your own Tran-Quill Pencil Kit! Just fill out the Rafflecopter form below but first, check out my pencil topper- possible chewy tip ideas. I want you to contribute yours too! Want to get it on Amazon? Don't forget to use my link to support thoughtful toy reviews for 2014! Links for pencil is coming soon. Here is a link for the book! 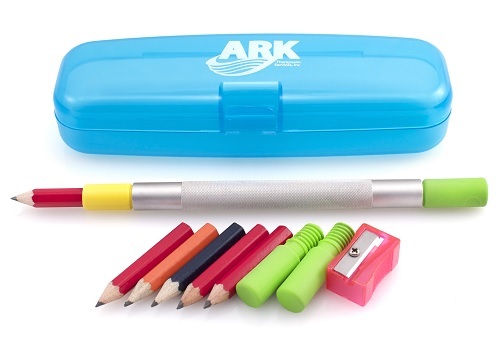 Want to get it on ARK's website? I am affiliate here too! So please shop either of these places to get what you need and support Toys Are Tools! Disclosure: Toys are Tools was not compensated by the manufacturer for the publication of this review. The reviewed items were provided to Toys are Tools to facilitate a review. Reviews are never promised. 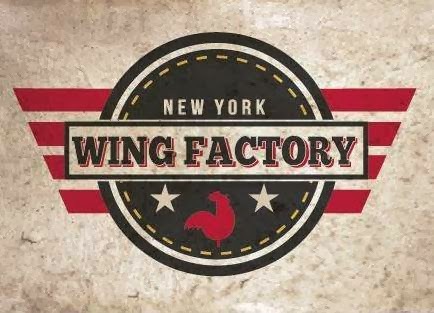 The giveaway prize is being offered by the manufacturer. 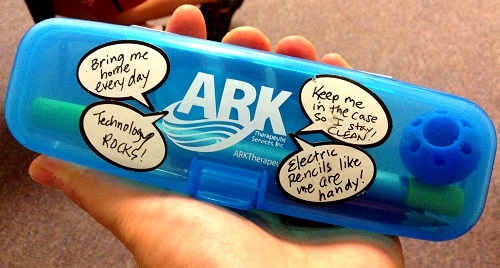 Toys are Tools is now an affiliate of ARK Therapeutic because Toys are Tools LOVES their products. Using any affiliate's link to make a purchase means that you can make your own purchase and we will receive a small commission at no additional cost to you. How about a pencil troll? 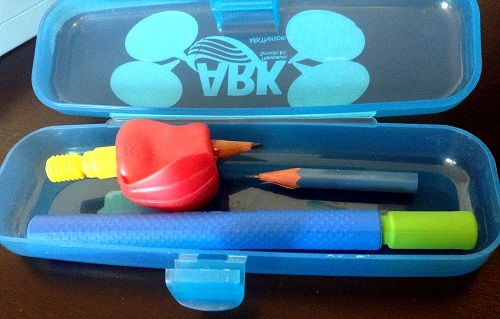 We top our pencils with one with blue hair among other things. They're cute for kids. 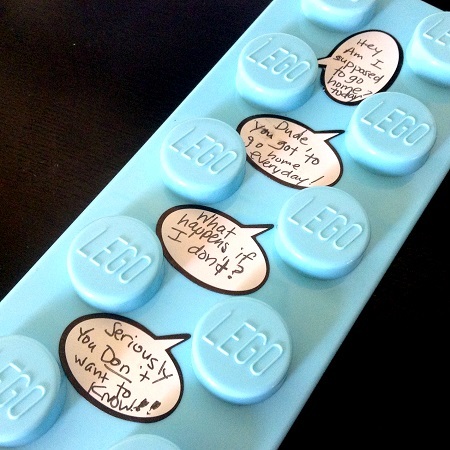 By the way, I like your Lego figuring idea, cute. http://www.arktherapeutic.com/SpacerTwoxAR.html They also have a one finger for older kids. 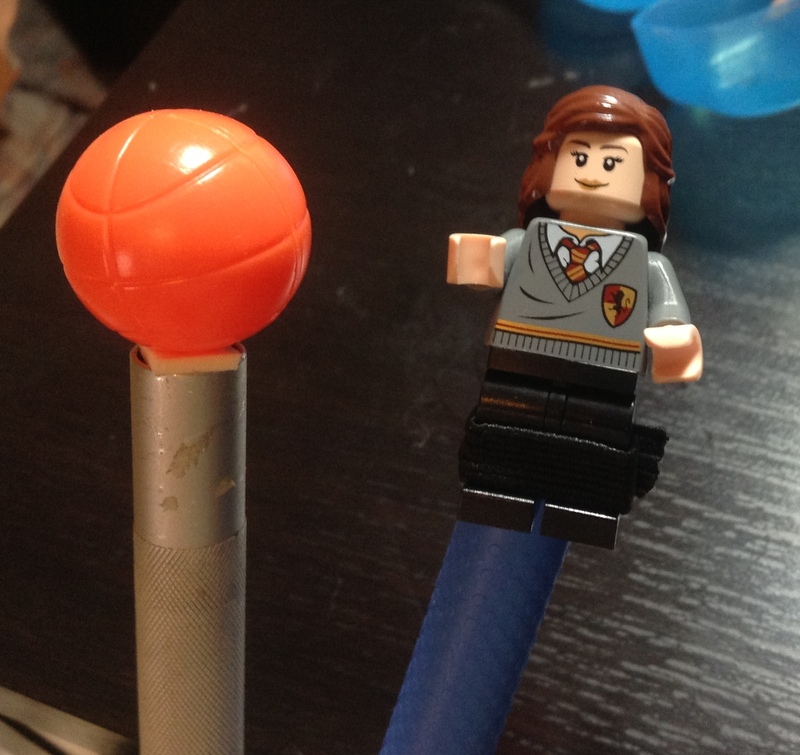 I would love to have an owl pencil topper! I think that would be cool! 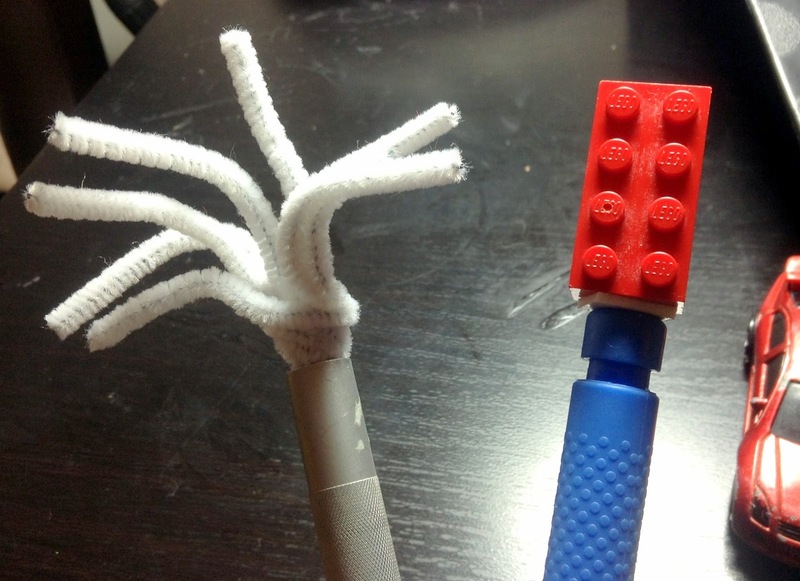 I would love to see you review Wikki Stix http://www.arktherapeutic.com/WikkiPrimAR.html I thin they have a lot of potential for fine motor skills while being a fun art project. I just wonder how easy they are to use without kids getting frustrated. I would love to see a topper like this: http://www.greenearthstores.com/?p=blog&id=83 we love these! I always have on in my bag and even keep one at my desk to use in meetings or long conference calls. On top of a pencil would be ideal! This product is exactly what have been looking for! 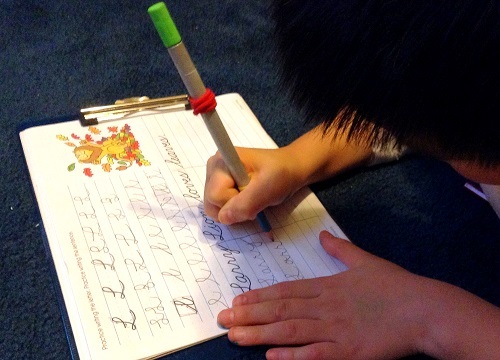 Both of my sons see an OT for fine motor and low tone issues and writing has been a huge issue for them. The only recommendations I have gotten have been for various pencil grips which do not help. This is the first thing I have seen that looks like it could really make a difference. The pencil topper we use is a squishable fish where the eyes pop out when you squeeze it. 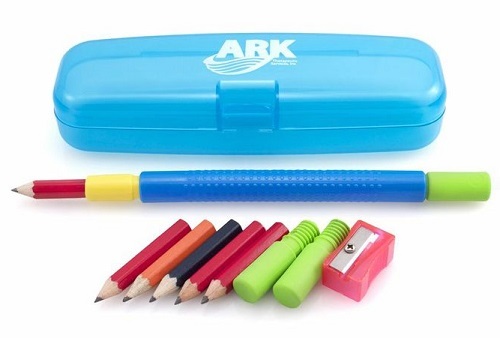 I think the ARK chewable toppers would be ideal for my six year old though. I agree that some options for older kids would be great. I would love to see a review of the Bubber and the Bubber Smart Shapes Kit. I am wondering how the Bubber compares to Play-Doh and other clays. Sorry, I forgot to leave the link for the Bubber in my comment. I think Wikki Stix are super fun fidgets. I give them to my son to use in class. I have actually never tried making art out of them. You are my kind of gal! I think that is sooooo cool. I think they could be finger massagers! The vibration is already there! Maybe pianists will do twenty minutes with it before performing a recital! MY son is soooooo into owls right now. It's a Harry Potter thing. Come to think of it, the LEGO Owl in Harry Potter sets would probably fit nicely inside. 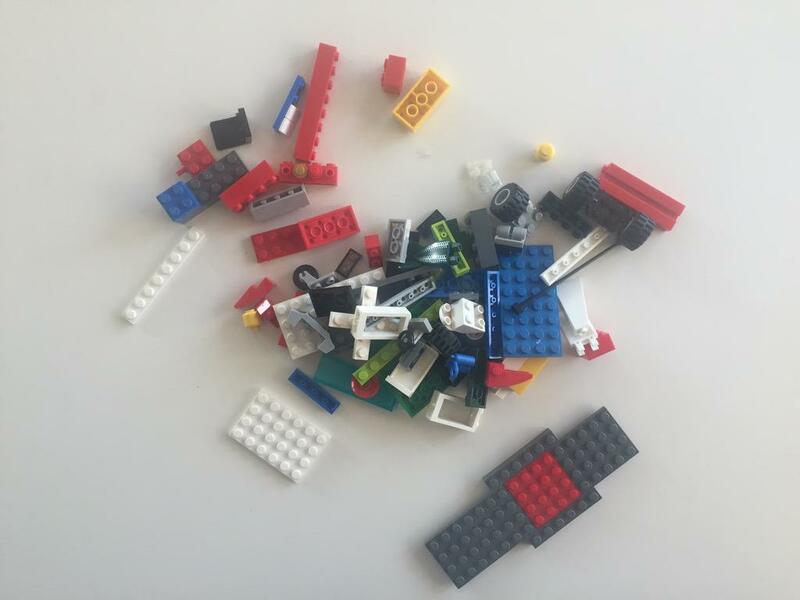 Oh, that LEGO! It is everywhere. Actually, aside from the little spoon, the Starter Kit isn't necessarily for young starters. If you have low muscle tone in your mouth, this could help wake things up. I am not a professional but I am quite certain that waking up those inner mouth and lower facial muscles can help with a lot such as speaking more clearly, saying consonants or vowels that are a bit hard for the child "wabbit", eating food as in remembering to chew your food and swallow it, eating food that requires a bit of chewing (vs. yogurt or melt-in-your-mouth crunchy food). This kind of talk may not be your thing but it's a problem that can affect stroke/traumatic brain injury patients, young children, older children, adults. Also, having taught English as a second language in the past, I would dare say that it could help adults learning a new language tackle some foreign-to-their-tongue sounds. I used to stick my fingers in the mouths of my adult students sometimes to help them take a stab at tough sounds- their muscles just did not know how to make those sounds. Think English: "th" or "r" in Spanish. Those sounds trip up everyone. Good point. As you said, I didn't look passed uses on my end. I stand corrected :) Thank you. For me, back to school shopping means finding products that can help keep my 3rd grader organized. I have spent ridiculous amounts of time comparing the pocket configurations of binder pouches to see which would be best for him. Also, helping both my kids figure out what they need at home to keep everything easily accessible for homework so it easier to focus and there is less wasted time. 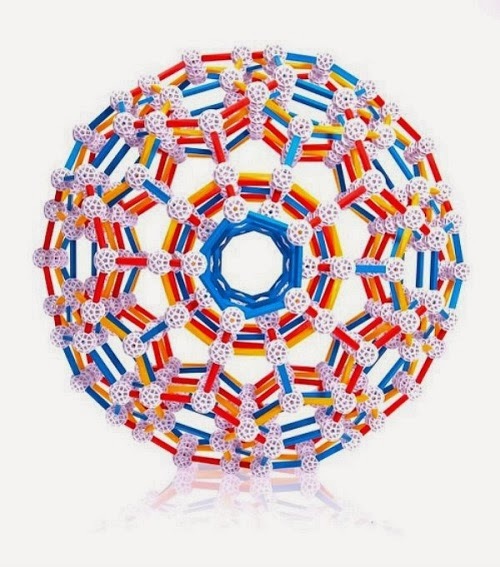 After reading your site, I will definitely be incorporating some fidgets to improve focus as well. Back-to-school to us means shopping for what we need to get by for the school year and perhaps a wants or two. Nothing special.